Build Targeted PowerPoint Presentations Fast! Asset and wealth management firms are finding difficulty keeping their PowerPoint presentations up to date for their executive and sales teams. Wealth management banks and financial asset management firms are using inadequate tools such as SharePoint, DropBox, or Google Drive to store and distribute their tools. Their tools are obsolete for presentation management because they are not designed for managing and distributing PowerPoint presentations and slides. The tools lack many other features available in a presentation management system. A PowerPoint slide library is the core of a presentation management system. Banks and investment firms of all sizes have amassed thousands of slides over the years. The bad news is that these slides are scattered across outdated file systems. None of these systems are designed for presentation management, nor do any of them have a slide library. You may feel that your PowerPoint presentation and slides are centralized for use by your organization. 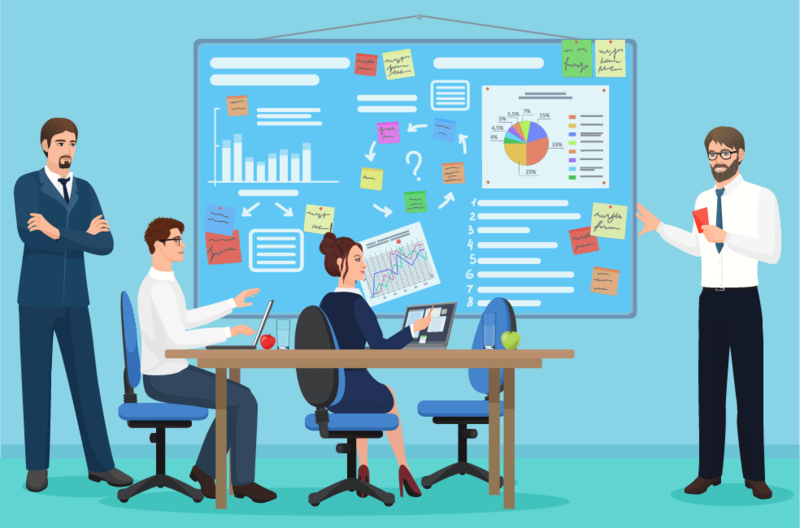 However, that is just one critical presentation management feature that you must address as the CEO, COO, VP of Marketing, or the presentation library administrator. As the PowerPoint library administrator, you must update slides on a regular basis and then distribute them to the entire organization. A single slide update replacement across fifty presentation decks may take one hour or more using PowerPoint. Certainly, opening and editing fifty presentations in PowerPoint will take longer than just one minute. How much time does it take for you to update 25 or 50 slides across 100 presentation decks? We all know that would take several days to a week’s worth of work. As the PowerPoint slide library administrator, you would benefit from a tool that can automate the slide update process and complete the same task in a fraction of the time. One client reported an 800% increase in efficiency because he did his slide update in five minutes using Epoch Slide as compared to 40 minutes with PowerPoint. Here are some tips to help you organize you PowerPoint Slide Library. The Presentation Management System is either available as managed hosting software as a service (SaaS) or an enterprise license installed on your intranet network web server. Regardless of the platform you choose, you will need to upload your entire slide library in the Presentation Management System. You can build your online library folder by folder and upload multiple presentations as required to build your online PowerPoint slide library. This can become time-consuming if you have thousands of slides to upload and organize into a centralized slide library system with folders and subfolders. In most cases, the slide library is not organized locally, and the administrator tries to upload and organize as they learn to use the Presentation Management System. Given the upload requirements, the task time length increases accordingly while you build your library in real time and schedule. The efficient way to build your PowerPoint Slide Library is on your desktop with all the folders and subfolders organized locally. Since you are not uploading, you can work faster to build your slide library. When you are done building your PowerPoint Slide Library, use the Epoch Slide Auto-Uploader tool to automatically upload your entire local slide library into the Epoch Slide Presentation Management System. The Auto-Uploader will automatically create all folders and sub-folders and upload presentations accordingly to replicate your slide library online. The Epoch Slide Auto-Uploader tool will save you a week or more in time as compared to doing the same process manually. Your company may organize PowerPoint content as slides or presentations for use by various teams. Once your presentations are in the slide library, you now can optimize presentation meta properties and add keyword tags to slides. These meta tags and slide keywords are searchable, so users can find choice slides for their masterpieces. Epoch Slide Presentation Management System’s intelligent slide library has many advanced features that increase productivity. These advanced features let the administrator optimize the slide library by creating pre-built presentations for users very quickly. Your teams have access to the latest approved slides and presentations for ease of customization to seize current opportunities. They can build better presentations faster than with their current method by using the company’s approved PowerPoint slide library. All slides are approved and up to date with content. They can search using keywords to find choice slides for building custom presentations faster than using PowerPoint alone.